Clean hands are the key to health! But sometimes you don't have an opportunity to wash hands, at such a moment we need an antibacterial hand gel. 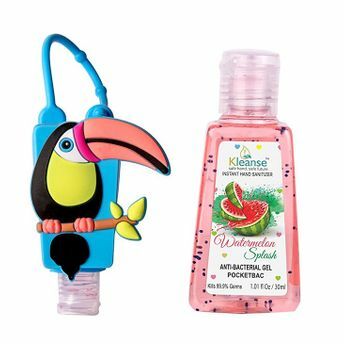 Kleanse's Advanced Instant Hand Sanitizer Watermelon Splash is able to give your hands that refreshing and welcoming scent you are looking for when you sanitize your hands. With watermelon being the top note, the watermelon splash is not a chemical overpowering smell, but it's a sweet smell that will make you feel fresh, clean and alive. Take this wonderful 1.1 oz travel size hand sanitizers bottle holders with you wherever you go for a convenient, easy, and FUN way to help keep the germs away. Explore the entire range of Hand Sanitizer available on Nykaa. Shop more Kleanse products here.You can browse through the complete world of Kleanse Hand Sanitizer .